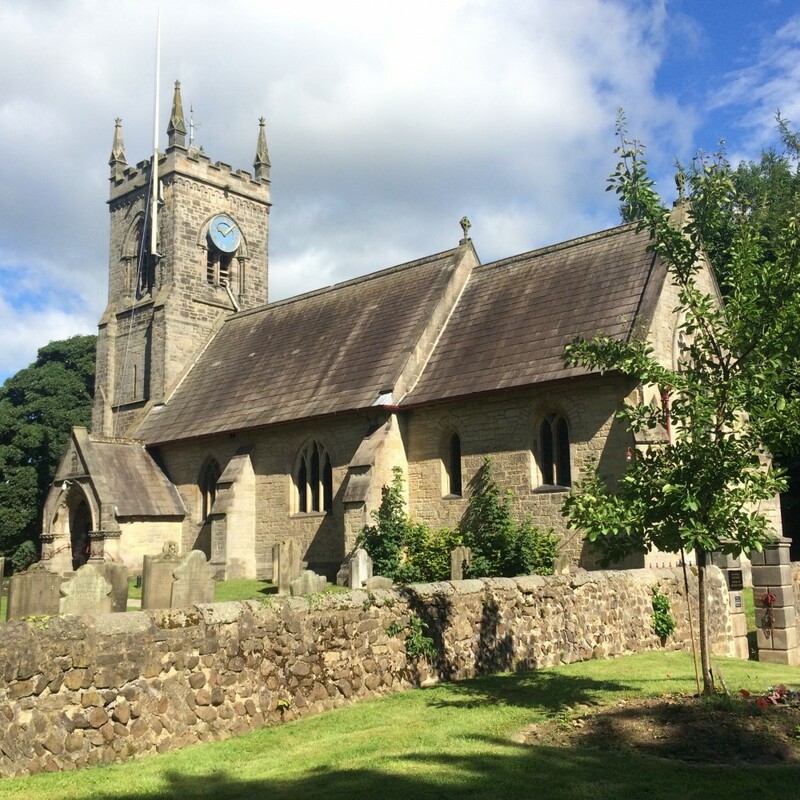 Nidd Church is part of the Knaresborough Team Ministry of which the Rector is the Revd Garry Hinchcliffe. The capacity of the church is about 120 and a typical congregation numbers about 35, with many guests visiting from the Hotel. We have recently installed an induction loop for the hard of hearing but otherwise no amplification. The church is usually open Monday to Saturday 9.30-4.00 and for the 10.30 Sunday service. Where else will you find a church with the “old” form of service every Sunday, with a clock that won’t strike 12.30, and weekly carol services from November? It’s at Nidd Church near Harrogate, 150 years old in 2018 but with roots back to the 13th century. To the delight of many worshippers we use the Book of Common Prayer (1662) for alternating services of Mattins and Holy Communion – ‘I haven’t used those words since I was a child!’ or ‘Those psalm chants take me right back to school days’. Tucked away in the trees to the east of the Ripley roundabouts is the Church of St Paul & St Margaret at Nidd. Not many people know about the church because it’s barely visible from the A61. There’s no sign post from the road but if you approach by the long drive leading to to Nidd Hall Hotel, you will find parking and the church just 100 yards from the front door. There has been a church on the site from 1242. Indeed, some stonework in the porch and the font in the baptistery date from this period. The present church was rebuilt in 1866 and will celebrate 150 years since consecration on Sunday 4 February 2018. It’s a “time warp” church. Apart from electric light, a peal of five bells, a tower clock and a north aisle extension, nothing has changed. Even the form of service is the same as that in 1662 – Revised Prayer Book or Book of Common Prayer, often with the King James Bible. The clock is an interesting example of some unusual features of the church. It chimes the hour with an appropriate number of strikes, and the half with a single strike. With most of the village employed on the estate in the fields in the late 1800s and early 1900s, the clock marked the passing hours and the one hour lunchtime at 12.00 noon. However, the half hour strike at 12.30 was often confused with the 1.00 pm strike so the workmen only had a 30 minute break. To remedy, the 12.30 strike was suppressed and to this day remains silent. There is an excellent two manual tracker action organ by Bevington & Sons of London, restored in 1999 through public donations and the generosity of the then Patron, the 17th Viscount Mountgarret. He died in 2004 and was succeeded by his eldest son Piers who became the 18th Viscount. 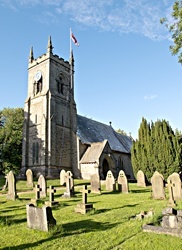 The typically English country churchyard was extended in 1981 by land given by the 17th Viscount. To consecrate, the Bishop walks round the boundary. However, there was a large bush growing through the wall. To walk inside the bush would reveal unconsecrated ground if ever the bush were removed or died. So, with difficulty, the Bishop’s party walked between the bush and the wall. The Bishop emerged with his mitre awry; the Registrar’s wig flopped over his eyes and the Viscount’s Brylcreemed hair was alive with greenfly. The congregation is the choir and none more so than in the seven weekly carol services in November and December each year, when the church is almost filled to capacity with Hotel guests on one of their popular Christmas/New Year breaks. Nidd is one of the few churches in the country where you can still chant the canticles in the service of Mattins at 10.30 on the first and third Sundays of the month. On other Sundays there is a service of Holy Communion at 10.30. The church is well served by clergy and readers from the Knaresborough Team Ministry under its Rector, the Reverend Garry Hinchcliffe. If you want to step back in time, to a church that has been alive since the 13th century, with liturgy and words familiar from your childhood, why not join us on a Sunday morning at 10.30, and perhaps take refreshment afterwards at the Hotel? Our church is one of the few in the diocese which uses the Book of Common Prayer (BCP) almost exclusively. The pattern of worship is simple: always 10.30am, 1st and 3rd Sundays - Mattins, all others - Holy Communion. For Mattins we sing the canticles to familiar chants plus four hymns. For Communion we just sing four hymns. We have a two manual pipe organ in excellent condition. All singing, good and not so good, is much appreciated. If you'd like a particular hymn or organ music played for some special occasion, please email organ@niddchurch.info.